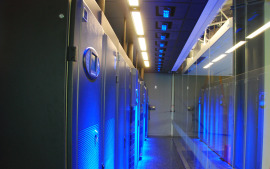 What does the data center network look like in 2012? All signs point to 10 Gigabit and 40 Gigabit Ethernet gathering steam in the coming year. Tidbits and predictions include 10 Gigabit and 40 Gigiabit Ethernet. Expect to see plenty of 10 Gigabit on server motherboards. You can even expect to see some 10 Gigabit Ethernet LAN-on-a-motherboard by early next year. All of which means 10 Gigibit at the edge and the start of 40 Gigabit in the core. 10 Gigabit Ethernet is a good starting point at the edge. It increases the bandwidth capacity for the backbone, and reduces network latency. And because it’s Ethernet, there’s built-in plug-and-play with existing equipment, reducing administration and operating costs. Moreover, with 10 Gigabit Ethernet, there’s a clear roadmap to 40 Gigabit and 100 Gigabit Ethernet, which will be vital in meeting the growing bandwidth requirements that come with cloud computing. How to tame these high density racks with containment data center design?